As promised, here is another of my Acorn Investment App updates. What started at $0, and then went to $75, and finally surpassed $100 is now nearly at $300! I’ve progressed farther than I thought. I now think this will surpass $750 by the end of the year. I’m realizing that one of the keys is to make as many one-time investments as you can as well. The round-ups will do their thing automatically, so whenever you make some extra cash, before spending it or paying bills, add some to your Acorns account. 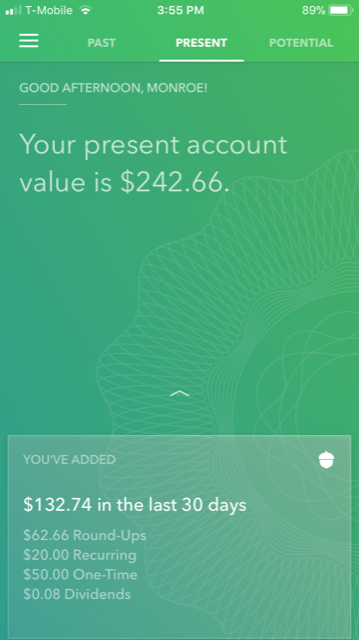 I have a bit of money coming in from a legal client this week, so I plan to invest $100 or $200 extra into my Acorns account. I am also going to be adding about $150 extra to my emergency savings funds again, after having depleted them recently. Got to get them back up! Right now, my roundups are set at 1x, but in a few months, I may change that to 2x, to ensure more money is being invested each week. Also, Acorns has partnered with many companies to allow you to grow your money faster: if you make a purchase (from Apple, for example) from the Acorns app, Apple will deposit a percentage of your total purchase price into your Acorns account. I haven’t tried this yet, but plan to soon. Truly, the only thing that could go wrong here is a stock market crash. But so far, the stock market seems to be growing every week. I am still diversified in other areas though–we never want to put all of our money in the same basket. That’s investment savvy 101. So no matter how awesome I think Acorns is, to put all my money there is foolish. Don’t do that! You can read all of my Acorns posts from the beginning by starting here: The beginning of my Acorns journey.